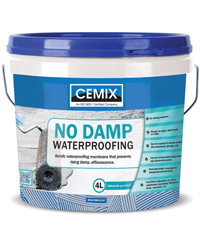 CEMIX NO DAMP WATERPROOFING is an acrylic brush-on membrane that will prevent rising damp, efflorescence and will resist negative hydrostatic pressure. It has excellent adhesion to most substrates including brick, masonry, concrete block, concrete, stone and timber and is simple to use by brush or roller. CEMIX NO DAMP WATERPROOFING is safe to use and can be overcoated using almost any decorative paint. CEMIX NO DAMP WATERPROOFING can be applied to damp surfaces and freshly laid hardened (green) concrete and conforms to the Building Code of Australia as a waterproof membrane. 1. On floors, spread the material using a brush or long nap roller to achieve coverage and finish using a long nap roller. 2. On walls, apply the product by brush/roller or spray, taking care to achieve required coverage. The second coat can be applied after 4 hours. When finishing, it is necessary to lay the material onto the surface and lightly finish to achieve the required dry film thickness per coat. 3. Care must be taken to work the material into voids and avoid pin holing. 4. A minimum of 2 coats is recommended for areas affected by hydrostatic pressure and care should be taken to ensure uniformity of material and the required coverage is maintained. Allow CEMIX NO DAMP WATERPROOFING to cure for 24 hours before applying adhesives, mortars, decorative coatings or other surface treatments. Care is necessary to ensure the waterproofing membrane is not damaged during subsequent treatments. It is recommended that the final coating applied to floor surfaces should be allowed to cure for at least 24 hours before further treatment to minimise the risks of mechanical damage. Keep containers securely sealed when not in use. Avoid physical damage to containers. All surfaces to be treated must be structurally sound and existing coatings, adhesives, efflorescence should be removed to achieve maximum bond strength and resistance to hydrostatic pressure. The surface may be damp (not wet) and must be cleaned free of dirt, grease, oil, or other surface contaminants. 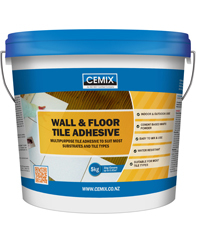 Holes/non-structural cracks should be filled with CEMIX FLOOR REPAIRER prior to using CEMIX NO DAMP WATERPROOFING. Recycle wherever possible of consult. manufacturer for recycling. Consult State Land Waste Authority for disposal.